Ok, so this idea may be a) rubbish, b) pretentious, c) pointless or d) a, b and c combined. But over Christmas, I spotted a whole deluge of Tweets, articles, Facebook statuses and so on from journalists – or their friends – talking about books they’d published. Now, we’ve all worked in newsrooms where journalists have felt they’ve got a book in them. The problem, in the past, was that to get the book published was often quite tricky – particularly if doing it around a job in a newsroom. The self-published best-selling Amazon author’s secret revealed. And it’s not rocket science. 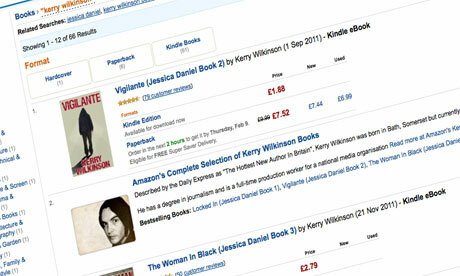 A mate of mine, Kerry Wilkinson, has been in the news this week – well, if you’re into news about books, he is. Kerry, a sports journalist who I’ve known for a few years, was the top-selling e-book author on Amazon UK in the last quarter of 2011, shifting 250,000 copies in the UK. Kerry has released three books – a detective series based around a copper named Jessica Daniel – and is currently writing two more. What makes Kerry’s success stand out is that he is a self-published author. No publisher – the ability to e-publish has meant he could get his work straight out to an audience. And it’s quite an audience he’s found too. Kerry first told me about his first book late last summer and I bought it – through iBooks as it happens. It was very good, and so was the second one, and the third – which is being read when the baby isn’t waking up at night, so slow going – is also excellent.